KWDT will build 54 biosand filters and 2 rainwater harvesting tanks. The breakdown of costs for expenses for the first installment of the BSF and RWH program. for this portion of the grant, KWDT has submitted their reports for the 2 tanks. Here is KWDTs update on the 27 filters. KWDT constructed and distributed 27 bio sand water filters. 18 out of the 27 filters have been installed and are functioning, while 9 have been applied for and delivered waiting for installation. Six of the bio sand water filters were distributed to schools while the rest have been taken and applied for by households. The list below indicated the bio-sand filter beneficiaries and applicants whose bio sand filters will be installed after the Christmas holidays. 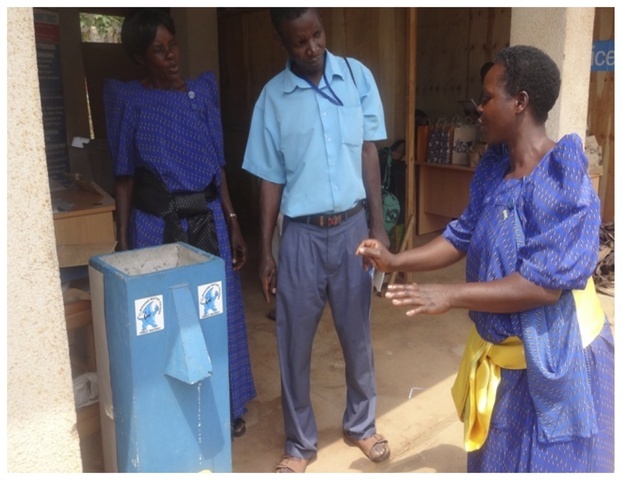 KWDT with the GWWI team leaders, Betty, Rose and Mastula carry out awareness on the of use bio sand water filter. This has been done through, coordination committee meetings, group meetings, exhibitions and community dialogues. The community members have been sensitized about the importance of using the facility, what the beneficiary stand to lose in monetary terms. KWDT was identified as a key player in the promotion of access to clean and safe drinking by Appropriate Technology Center (ATC) an arm of the Ministry of Water and Environment to take part in the 2nd National Water and Sanitation Technology exhibition which took place on the 18th December 2013. During this exhibition, KWDT shared experiences with various people on the use of the bio sand which attracted a lot of attention. - comfort talked to Rose N. They have an end of year event where they evaluate the entire KWDT program. They are going to talk about everything and will talk about their 2nd implementation. 2nd Implementation was delayed because they were giving exams. But they know who is going to benefit. There was a miscommunication and a missed email regarding the conditions of the issuance of the BPN balance. KWDT had not provided a complete report for the 27 filters and 2 tanks they received the BPN grant for. There are currently 15 BSFs that must be accounted for. toilet digesters tested and worked! KWDT is now adding toilet digesters to their stable of WASH products. Digesters are an enzymatic process that completely clears out solid waste in full pit latrines which can often go unused once they are full..
- Comfort was supposed to go do another visit this weekend but Val has to leave the country. - Already started working on it and technicians asking for specs. - Want to build square toilets using round bricks. - Request to use square bricks as long as it stays within budget. - Cut slab and dig pit. - will travel to Katosi on Wed or Thurs this week. - women who learned to make soap were grateful they were given instructions. no one had ever taught them! happy to make soap on their own. If they were trained, they went through too fast. GWWI explained step by step. There was a misunderstanding in their budget. They are building 2 toilets per stance = 4 toilets. They will be implementing for shared households. Will be training women to make digesters and soap for the Sanitation Training. Uganda schools are on strike. KWDT on site sanitation training is pushed back because GWWIMoyo training is delayed. Comfort and Godliver (GWWI Tech Trainer) to go over budget for toilets. Also discussed about the soap training. GWWI waiting to wire Sanitation seed grant when budget is cleared up. The Sanitation training is a separate project and is not funded by the BPN grant. However, we are including it because it is relevant to the women's growth as WASH entrepreneurs and also accounts for their other activities outside of the BPN grant. KWDT is still mobilizing resources and getting community support to build 2 toilets as a requirement for their participation in the GWWI training program. - comfort write emails to women about who they should talk to - which officer and which official to speak to. Comfort and team take a much needed break from July 20-Aug 4 while the women's teams including GWWI Moyo prepare for their on site Sanitation Training by raising money, gathering materials, getting community support and donations and coordinating volunteers and trainees. GWWI conducted a site visit to the team participants to see how they're doing and check on the technologies, educational outreach and impact. KWDT took us to the schools where they implemented the tanks. Comfort and GWWI Team (Rose, Godliver and Gemma) embark on a 3 week journey to travel to 10 sites in Kenya, Tanzania and Uganda to conduct M&E visits and interview users/non-users. Comfort Mukasa contacts KWDT and GWWIM team members to make sure they have proper documentation to travel to Kisumu for the GWWI Sanitation training where they will learn to build toilets and make hygiene products to sell. It was discovered that KWDT team members Betty and Rose did not have the proper documents to travel to Kisumu so they had to deal with a process to get the documentation. KWDT midterm report for funding attached. GWWI Team will conduct M&E visits in mid-July. Expect M&E reports next month. The plans for the next tank to built at Katente primary school in Nakisunga sub county at Katente village. Same process of community mobilizing, sensitization etc has begun. Also, the BSF plans to implement 15 BSFs in 3 schools have begun. Comfort Mukasa, GWWI Uganda Coordinator and Godliver Businge, GWWI Head Technology trainer arrive in Katosi to help conduct the RWH/ISSB tank construction training to provide support for Namukasa Rose, Kajulle Betty and Namaganda Mastula to facilitate the construction and training. They begin making ISSB bricks using sand, marram, cement and water. This week they will dig and lay the foundation of the tank at the Kojja Senior Secondary School in Nsanja village, Ntenjeru sub county. They engage another KWDT female mason to learn the technology and prepare 5 other women to volunteer and learn to construct the technology. The women's group learning the technology is called 'Manyi Ga Mulimi' , or strength of the farmer. On Friday, with the GWWI team, they will conduct a WASH seminar in the school on the importance of hygiene - introduce the F-Diagram. For the construction, the women donate their time, and tools, the school donates the sand and marram. The first activities will be to build 2 rainwater harvesting systems with ISSB tanks. The BSFs will be implemented after the RWH systems are constructed. After meetings with KWDT staff and the women in the community who will be building the technology and those who will be learning, a RWH/ISSB tank construction and training program is now scheduled for April 8, 2013. Expected activities: Build an ISSB tank with the two KWDT women trained by GWWI taking the lead and inviting women from other women's groups in the KWDT to learn. GWWI Technical team will be training alongside the KWDT women to ensure build their capacity as trainers while building the technology. Following this training - the 2nd tank will be constructed soon following. Based on communications with GWWI Uganda Coordinator, Comfort Mukasa, sensitization and mobilizing activities are still ongoing. People in the community are being informed of the RWH construction training, KWDT is promoting the technology and some are being invited to participate to learn how to build it. KWDT received the funding for the training. They are now beginning their plans for sensitization, mobilizing, and setting up a training to make sure that when they build the tanks they are also making sure others learn so they can continue the knowledge sharing. KWDT and GWWI want to ensure that implementations are done in a way so that it's not just constructing the technology, but others learn as well. Implementing org #1 - KWDT, named the Best Performing WASH NGO in Uganda and the 2011 3rd Kyoto World Water Grand Prize at the World Water Forum in Marseilles. KWDTs unique model in working with women's circles and training the local women to build each other's ferro cement tank is replicable and sustainable. The KWDT women's circles raise money through "Merry-Go-Rounds", where members contribute a fixed amount per month and one woman will receive the full month's contribution to invest in a RWH system. KWDT members Rose and Mastula are GWWI trainees and will be implementing the BSF project. 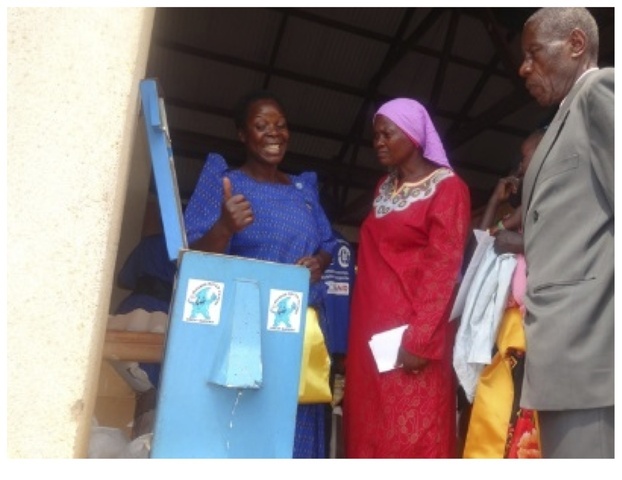 Implementing org #2 - MCS is Marindi Co-operative Society - now known as Global Women's Water Initiative Moyo (GWWIM) is an organised group composed of women trained in WASH. The group’s main activity is carrying out small scale credit and savings services to its members. MCS members Angella and Martha are GWWI trainees and will be implementing the RWH projects. They are both retired nurses and health workers and continue to offer health education, gardening, poultry farming, tree nursery management and other vocational training. Training org - GWWI trains women in Sub-Saharan Africa to to build simple water and sanitation technologies so they can become economically self-reliant and improve their communities' health. GWWI provides women with tools to educate their community about hygiene and water protection as well as technical skills to build rainwater harvesting tanks, water treatment technologies and toilets. With this training, participants have the potential to start micro-businesses. GWWI Director Gemma Bulos is a multi-award winning social entrepreneur integrating social entrepreneurship into the WASH sector in the Philippines via A Single Drop for Safe Water, an organization she founded in 2006.